Originally a computer game, Snood from EA has spawned and now exists on many platforms–most recently, the iPhone (thanks to Electronic Arts). It has a snazzy new look, but its style is the same…that is to say, the objective is still to clear the playing field by launching randomly selected Snoods from a cannon. Drag your finger to aim, and tap the Snood to fire. Snoods that are in strings of three or more of the same color are teleported off the playing field, along with any Snoods hanging from them; the more Snoods teleported, the higher your score. Launching Snoods causes the danger meter (on the bottom right) to fill up, and if full, the Snoods are descended a row. The game is over once the Snoods hit the bottom of the playing field. With over 100 unique puzzles and five levels of difficulty, this game app already has a lot to offer. But in true overachiever fashion, the developers also present you with more options, such as choosing between four modes (Classic, Story, Time Attack, Puzzle) and even between two Snood types (old and new). Additionally, there are special Magic Snoods that show up under certain circumstances and need special attention. You can also garner more points if you teleport Snoods off with style: Bank Shots (ricocheting them off the walls) and Streaks (teleporting sequential groups) may be more difficult, but worth the inflow of points. Triple tap the screen to pause. Snood has been around for over 10 years, and it’s little wonder why. The original concept is great, but with the additional options and the physics-based gameplay that the iPhone platform offers, Snood is downright addicting. 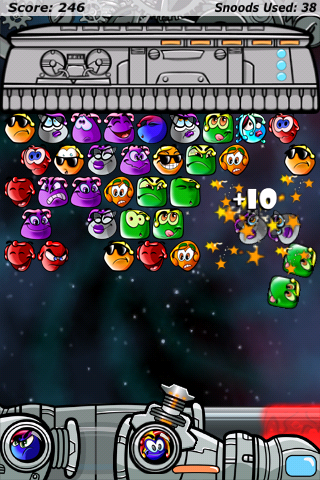 The new graphics are colorful and bright and the animations funny; check out those grumpy Snood faces. True, it is difficult to aim–dragging your finger is not exactly an accurate measurement–but it only adds to the challenge. You can even play with friends through Facebook or by using Wi-Fi. For a matching-colors game, it can get surprisingly involving…there’s enough fodder to keep you occupied for a long while. Standing such a testament of time can’t be easy, and you’ll probably see clearly why this iPhone app has after giving it a try. Even with all the new additions and the makeover, Snood remains at its heart a simple puzzle game–one that you can’t help but come back to. AppSafari review of Snood was written by Julie Guan on March 2nd, 2010 and categorized under App Store, Featured, Fun, Games. Page viewed 3178 times, 2 so far today. Need help on using these apps? Please read the Help Page.